Claudette Wile speaks to the 2nd and 3rd grade students in front of the Earth Balloon at Bates School. 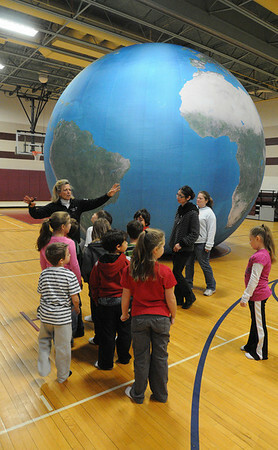 Students were guided on an interactive journey outside and inside the 20-foot diameter inflatable model of the Earth made up of a high resolution satellite imagees with true to life colors. Photo by Ken Yuszkus/Salem News, Friday, November 5, 2010.